Ecce lignum crucis, in quo salus mundi pependit. Venite, adoremus. Behold the wood of the cross, on which hung the Saviour of the world. Come, let us worship. Father Raniero Cantalamessa, OFM Cap., quoted that familiar refrain as he concluded his homily at the Good Friday liturgy. The Papal household preacher delivered the homily, as has in the past on this solemn day. 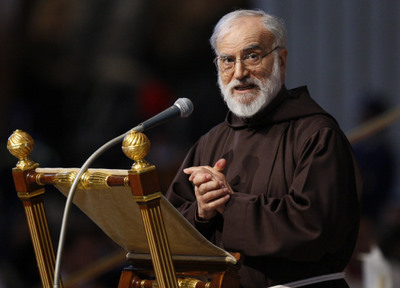 Father Cantalamessa, who will also be featured in next month's Nothing More Beautiful, encouraged the faithful to proclaim that refrain with greater conviction and gratitude because despite the sufferings we experience now, God has saved us and "loved the world so much that he gave His only-begotten Son" (John 3:16). What do you do to reassure someone that a particular drink contains no poison? You drink it yourself first, in front of him. This is what God has done for humanity: he has drunk the bitter cup of the passion. So, human suffering cannot be a poisoned chalice, it must be more than negativity, loss, absurdity, if God himself has chosen to savour it. At the bottom of the chalice, there must be a pearl. We know the name of that pearl: resurrection! His testament is a legacy to us, his brothers and sisters in the faith, and it would be an act of ingratitude to allow it to be quickly forgotten. In His passion – writes Saint Paul to Timothy – Jesus Christ “has given his noble witness” (1 Tim 6,13). We ask ourselves: witness to what? Not to the truth of his life or the rightness of his cause. Many have died, and still die today, for a wrong cause, while believing it to be right. Now, the resurrection certainly does testify to the truth of Christ. “God has given public proof about Jesus, by raising him from the dead”, as the Apostle was to say in the Areopagus at Athens. (Acts 17, 31). Death testifies not to the truth of Christ, but to his love. Of that love, in fact, it is the supreme proof. “No-one can have greater love than to lay down his life for his friends” (Jn 15, 13). One could object that there is a greater love than giving your life for your friends, and that is to give your life for your enemies. But that is precisely what Jesus has done: “Christ died for the godless”, writes the Apostle in the Letter to the Romans. “You could hardly find anyone ready to die, even for the upright; though it is just possible that, for a really good person, someone might undertake to die. So, it is proof of God’s own love for us that Christ died for us while we were still sinners. (Rm 5, 6-8). “He loved us while we were enemies, so that he could turn us into friends” , exclaims St Augustine. A certain one-sided “theology of the cross” can make us forget the essential point. The cross is not only God’s judgement on the world and its wisdom; it is more than the revelation and condemnation of sin. It is not God’s NO to the world, it is the YES God speaks to the world from the depths of his love: “That which is wrong”, writes the Holy Father in his latest book about Jesus, “the reality of evil, cannot simply be ignored; it cannot just be left to stand. It must be dealt with; it must be overcome. Only this counts as true mercy. And the fact that God now confronts evil himself, because men are incapable of doing so - therein lies the “unconditional” goodness of God”. But how can we have the courage to speak about God’s love, with so many human tragedies before our eyes, like the disaster that has struck Japan, or the shipwrecks and drownings of these last few weeks? Should we not mention them at all? But to stay completely silent would be to betray the faith and to be ignorant of the meaning of the mystery we are celebrating today. 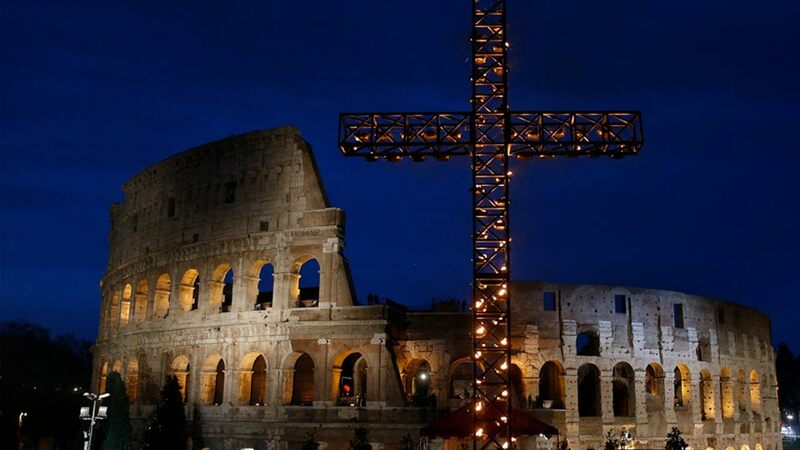 There is a truth that must be proclaimed loud and clear on Good Friday. The One whom we contemplate on the cross is God “in person”. Yes, he is also the man Jesus of Nazareth, but that man is one person with the Son of the Eternal Father. As long as the fundamental dogma of the Christian faith is not recognised and taken seriously – the first dogma defined at Nicea, that Jesus Christ is the Son of God, and is himself God, of one substance with the Father - human suffering will remain unanswered. One cannot say that “Job’s question has remained unanswered”, or that not even the Christian faith has an answer to give to human pain, if one starts by rejecting the answer it claims to have. What do you do to reassure someone that a particular drink contains no poison? You drink it yourself first, in front of him. This is what God has done for humanity: he has drunk the bitter cup of the passion. So, human suffering cannot be a poisoned chalice, it must be more than negativity, loss, absurdity, if God himself has chosen to savour it. At the bottom of the chalice, there must be a pearl. We know the name of that pearl: resurrection! “In my estimation, all that we suffer in the present time is nothing in comparison with the glory which is destined to be disclosed for us”. (Rom 8, 18), and again: “He will wipe away all tears from their eyes; there will be no more death, and no more mourning or sadness or pain. The world of the past has gone.” (Ap 21, 4). If life’s race ended here below, we would have every reason to despair at the thought of the millions, if not billions, of human beings who start off at a great disadvantage, nailed to the starting line by poverty and underdevelopment, without even a chance to run in the race. But that is not how it is. Death not only cancels out differences, but overturns them. “The poor man died and was carried away by the angels into Abraham’s embrace. The rich man also died and was buried …in Hades” (cf. Lk 16, 22-23). We cannot apply this scheme of things to the social sphere in a simplistic way, but it is there to warn us that faith in the resurrection lets no-one go on living their own quiet life. It reminds us that the saying “live and let live” must never turn into “live and let die”. The response of the cross is not for us Christians alone, but for everyone, because the Son of God died for all. There is in the mystery of redemption an objective and a subjective aspect. There is the fact in itself, and then awareness of the fact and our faith-response to it. The first extends beyond the second. “The Holy Spirit – says a text of Vatican II – offers to all the possibility of being made partners, in a way known to God, in the paschal mystery” . One of the ways of being associated with the paschal mystery is precisely through suffering: “To suffer”, wrote John Paul II in the days following the attempt on his life and the long convalescence that ensued, “means to become particularly susceptible, particularly open to the working of the salvific powers of God, offered to humanity in Christ” . Suffering – all suffering, but especially that of the innocent and of the martyrs - brings us into contact with the cross of Christ, in a mysterious way “known only to God”. After Jesus, those who have “given their noble witness” and “have drunk from the chalice” are the martyrs! The account of a martyr’s death was called “Passio”, a passion, like that of the sufferings of Jesus to which we have just listened. Once more the Christian world has been visited by the ordeal of martyrdom, which was thought to have ended with the fall of totalitarian atheistic regimes. We cannot pass over their testimony in silence. The first Christians honoured their martyrs. The records of their martyrdom were circulated among the churches with immense respect. In this very day, in a great Asian country, Christians have been praying and marching in the streets to avert the threat hanging over them. One thing distinguishes genuine accounts of martyrdom from legendary ones composed later, after the end of the persecutions. In the former, there is almost no trace of polemics against the persecutors; all attention is concentrated on the heroism of the martyrs, not on the perversity of the judges and executioners. Saint Cyprian even ordered his followers to give twenty-five gold coins to the executioner who beheaded him. These are the disciples of the one who died saying: “Father, forgive them; they do not know what they are doing”. Truly, “Jesus’ blood speaks a different language from the blood of Abel (Heb 12:24): it does not cry out for vengeance and punishment; it brings reconciliation” . Even the world bows before modern witnesses of faith. This explains the unexpected success in France of the film “Of Gods and Men”, which tells the story of the seven Cistercian monks slain in Tibhirine on the night of the 26th and 27th March 1996. And who can fail to admire and be edified by the words of Shahbaz Bhatti, a Catholic politician in Pakistan who was recently killed for his faith? His testament is a legacy to us, his brothers and sisters in the faith, and it would be an act of ingratitude to allow it to be quickly forgotten. He wrote: “I was offered high government positions and asked to quit my struggle but I always refused to give up, even at the cost of my life. I do not want popularity; I do not want any position. I just want a place at Jesus’ feet. I want my life, my character, my actions to speak for me and indicate that I am following Jesus Christ. Because of this desire, I will consider myself most fortunate if - in this effort and struggle to help the needy and the poor, to help the persecuted and victimized Christians of Pakistan - Jesus Christ will accept the sacrifice of my life. I want to live for Christ and I want to die for Him”. We seem to hear again the martyr Ignatius Antioch, when he came to Rome to suffer martyrdom. The powerlessness of the victims doesn’t however justify the indifference of the world toward their fate. “The upright person perishes –lamented the prophet Isaiah - and no one cares. The faithful is taken off and no one takes it to heart” (Is 57: 1). Christian martyrs are not the only ones, as we have seen, to suffer and die around us. What can we believers offer to those who have no faith, apart from the certainty our own faith gives us that there is a ransom for suffering? We can suffer with those who suffer, weep with those who weep (Rom 12, 15). Before proclaiming the resurrection and the life, with the weeping sisters of Lazarus before Him, “Jesus wept” (Jn 11, 35). At this time we can suffer and weep, most of all with the Japanese people, now recovering from one of the most devastating natural disasters in history. We can also tell those brothers and sisters in humanity that we admire the example of dignity and composure which they have given to the world. Globalisation has at least this positive effect: the suffering of one people becomes the suffering of all, arouses the solidarity of all. It gives us the chance to discover that we are one single human family, joined together for good or ill. It helps us overcome all barriers of race, colour or creed. As one of our poets put it: “Peace, you peoples! Too deep the mystery of the prostrate earth” . But we must take in the teaching contained in such events. Earthquakes, hurricanes and other disasters that strike the innocent and the guilty alike are never punishments from God. To say otherwise would be to offend both God and humanity. But they do contain a warning: in this case, against the danger of deluding ourselves that science and technology will be enough to save us. Unless we practise some restraint in this field, we see that they can become more devastating than nature itself. There was an earthquake also at the moment when Christ died: “The centurion, together with the others guarding Jesus, had seen the earthquake and all that was taking place, and they were terrified and said: ‘In truth, this man was son of God’” (Mt 27,54). But there was an even bigger one at the moment of his resurrection: “And suddenly there was a violent earthquake, for an angel of the Lord, descending from heaven, came and rolled away the stone, and sat on it” (Mt 28, 2). This is how it will always be. Every earthquake that brings death will always be followed by an earthquake of resurrection and life. Someone once said: “Only a god can save us now”. (“Nur noch ein Gott kann uns retten”) . We have the sure and certain guarantee that he will do exactly that, because “God loved the world so much that he gave His only-begotten Son” (Jn 3,16). Let us, then, prepare to sing the ancient words of the liturgy with new conviction and heartfelt gratitude: “Ecce lignum crucis, in quo salus mundi pependit: See the wood of the cross, on which hung the saviour of the world. Venite, adoremus: Come, let us worship. 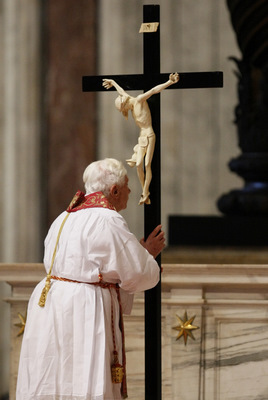 Images: CNS photo/Paul Haring: Pope Benedict XVI venerates the crucifix during Good Friday service last year in St. Peter's Basilica at the Vatican and Capuchin Father Raniero Cantalamessa delivers the homily during last year's Good Friday service.